Who said tours have to be boring walk arounds quiet museums. When you say tour in Vegas you get hi-flying hi-jinx among other things. Finding our Vegaster tour picks involved a little bit of dramomime and a whole lot of courage. Make sure you bring your camera when you check out any of our Vegas tour picks. Maverick Helicopter Tours: You haven’t seen the Grand Canyon until you’ve seen it from above. Maverick Helicopter boasts the best copters in the city, with a seating capacity for 6. They’ll even land inside of the canyon and let you walk around or take a pontoon boat down the Colorado River. Maverick also makes does night flights over the city of neon, small plane excursions over the desert. We got a lot of great shots in on this tour, but the best pic of the day was a shot looking down into the canyon from the sky. Presidential Limousine: Whether you are a group of 1 or 30 Presidential has what it takes to give you a full tour of Vegas. They picked us up right in front of the hotel in a stretch Hummer H2 (which was way too big for us but hey, Vegaster footed the bill). There were choices to go to the Grand Canyon, a winery and even a reality show tour, but we went for 3 and half hours of just driving around Vegas. These guys even stop and let you party a bit at some of the touristy spots like the Vegas sign, where we got our top photo-op picture pick for this tour. Only because it was so Vegas cliché. Pink Jeep Tours: So the name doesn’t exactly ring excitement, but Valley of Fire Tour should. Packed into a comfortable-albeit pink- jeep you get to choose a full day or six hour tour of Vegas’ first national park. The incredibly colorful Mohave Desert is something everyone who visits Vegas needs to see at least once –even if in a pink jeep. All kidding aside, the driver did a great job in showing us all the sites and stopped for photo ops. Our favorite picture pick? In front of Rainbow Vista. The Walking Gourmet: This appealed to the food loving side of us. A tour that covers 5 different restaurants with a little sampling of the food, a cocktail and of course dessert. Choose either the Mandalay Bay or Palazzo & Venetian and spend 3 hours touring the restaurants inside. We felt Italy and went for the P&V tour. The cool thing is that they mix it up all the time, so you never know where you may find yourself sipping wine. Our picture was pure luck as our tour happened upon Carlo’s Bakery when Buddy was in town. He was real cool about giving us the photo op. Sip the Strip: And then the drinking side of us was sated. 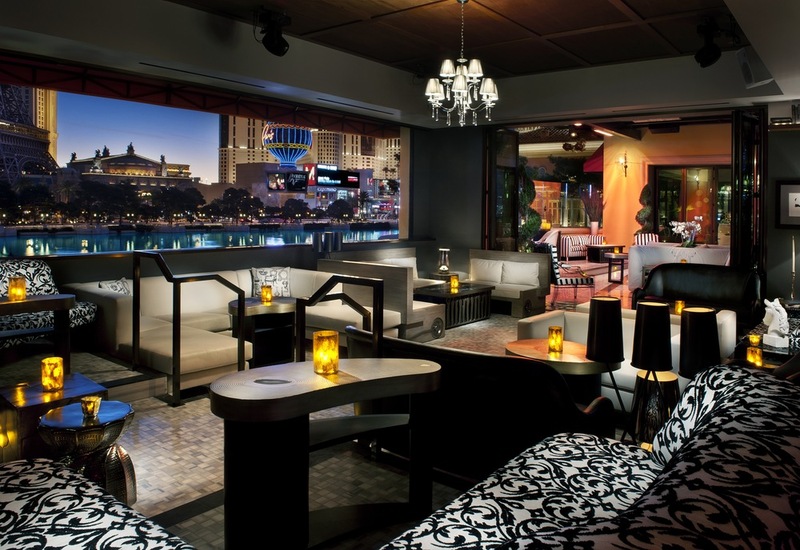 On foot you get to cut the line at 5 of Vegas’s hottest night spots. The hostess hooks you up with a drink, while you crane your head looking for P-Diddy in the crowd. Our tour got us an hours worth of VIP treatment at HYDE, where we got our picture of the Bellagio Fountains going right outside of our table. Hoover Dam Mini Bus Tour: This was a fun way to see Boulder City, Lake Mead and Hoover Dam all in one shot. The mini bus tour gives you two hours to explore the dam, museum and movie room before shuttling you back to the city. This was one of the more relaxing tours we did and probably the best if you are traveling with kids. The picture pick here of course is that shot from the top of the dam. Neon Museum and Boneyard: If there is going to be one museum on the list it is going to be of neon. Someone had the great idea of saving all the old signs that used to bedeck Vegas locals and put them in one spot. There were over 150 signs, some restored, to check out on the tour, which is guided by a very friendly guy who can tell you the history of all of the signs. Our picture pick turned out to be the marriage of two perfect signs. The tours in, around and beyond Vegas are not your typical tours. Here you are going to find some thrills along with unique ways to see Vegas from the inside. Let an expert show you around for a while and you’ll find there’s a still a lot of Vegas you’ve been missing.